CK2 by Calvin Klein is a fresh, woody and ozonic unisex fragrance. This is a gender neutral fragrance, the minimalist design of the bottle means that the clear tube can stand, sit right-side up or upside down – whatever way you swing it, the clever design works for everyone! Now to the scent itself, CK2 has a lovely opening of citrus, violet leaf and wasabi. This unique combination of top notes fades into a calming heart of roses and peony, which adds a floral but not too feminine vibe to the aroma. The woody base is made of clear sandalwood and white musk. CK2 is like walking on wet pebbles during a thunderstorm. It is watery, airy and clean with a touch of crispness. A perfect buy if you are looking for an everyday, easy-to-wear fragrance that’s refreshing and pleasant, but which won’t call too much attention to itself. CK2 by Calvin Klein was launched in 2016. Bought for my wife as she had finished the last bottle. Couldn't find it locally when searching online. Arrived quickly and wife delighted. Smells amazing and is a good size and quite cheap for such a big bottle which is great!! Will definitely buy again! 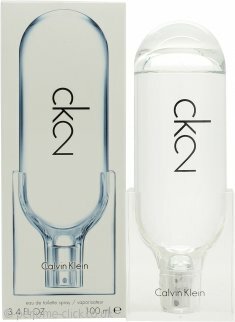 CK 2 Eau de Toilette spray by Calvin Klein has a freshness and that make it a good day to day wear being cool and natural it will become a staple scent for me.